Questioner: Namaskaram, Sadhguru. What is the significance of the spinal twisting postures that we do after the sarvangasana series? 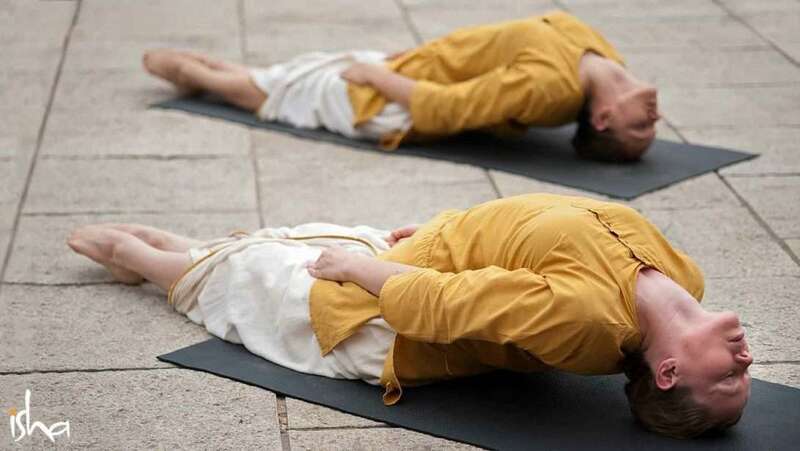 Sadhguru: If you see the body as two halves split horizontally in the middle, the lower part weighs much more than the upper part. The largest muscles and biggest bones are in the lower body. And the spine is designed to support a certain amount of weight. Even a slight overload of the spine will create problems, because it is a subtle thing, made of 33 pieces of bone. It is very important that the spine is exercised. Otherwise it will become rigid and useless. If you do not exercise it, your ability to experience life decreases dramatically. You could compare the spine to the suspension of a car. If you have seen certain luxury cars in India, they will be in the garage half the time simply because they have multi-link suspensions, while our roads are made for one-link suspensions. If you go a little fast and hit a road hump, multi-link suspensions may go out of alignment, and you go straight to the garage. They are not made for such a level of stress. You can still drive, but it will drag. The idea of a multi-link suspension is enhanced maneuverability. Similarly, your spine is a 33-link suspension. When you do any kind of upside-down posture, there is an exceptionally high amount of weight on the spine. Because of that, after doing any inverted asana, you have to take the time to flex the spine back to its natural state. Therefore, after sarvangasana and halasana, you do ardhamatsyasana, which means bending backwards, in the opposite direction. Why do these postures in the first place? It is very important that the spine is exercised. Otherwise it will become rigid and useless. If you do not exercise it, your ability to experience life decreases dramatically. Not everyone experiences life with the same level of sensitivity. Going back to the car analogy, not every suspension experiences the road with the same sensitivity. The sensitivity of your suspension determines the maneuverability. If it is super-sensitive, it maneuvers well, but one pothole, and it gets misaligned. So it is important to keep the spine sensitive, flexible, well-aligned, and mobile. All the yoga you do is in some way aimed towards that. So, after sarvangasana, which reverses the load upon the spine, it is extremely important that you stretch the spine back to its normal self. I call it a “self,” because without the spine, you would not experience most of the things that you experience as a human being. It is designed to do things you would not imagine possible. Keeping the spine well-protected, strong, and sensitive is important for a yogi because you want to experience the whole universe as a part of yourself. Editor’s Note: Excerpted from a talk by Sadhguru at the Isha Hatha Yoga School. For dates and details of Hatha Yoga programs, visit www.ishahathayoga.com. A version of this article was originally published in Isha Forest Flower March 2016. Download as PDF on a “name your price, no minimum” basis or subscribe to the print version. This is the precise weblog for anyone who wants to search out out about this topic. You notice a lot its virtually arduous to argue with you (not that I really would needHaHa). You undoubtedly put a brand new spin on a topic thats been written about for years. Nice stuff, simply great! A helpful share, I just passed this onto a student who was doing a little analysis on this. And he in fact purchased me lunch because I found it for him.. smile. So let me reword that: Thank you for the treat! But yeah Thnkx for spending the time to talk about this, I feel strongly about it and love learning more on this topic. If possible, as you gain expertise, would you mind updating your blog with more info? It is extremely helpful for me. Big thumb up for this article! I precisely desired to appreciate you all over again. I do not know what I might have followed in the absence of the entire recommendations contributed by you on such field. It was actually a very troublesome problem for me, however , finding out the very professional tactic you treated it took me to cry for delight. Im thankful for the advice and hope that you recognize what an amazing job that you are putting in teaching others using your blog post. I know that you havent met any of us. Interesting point of view. What are your thoughts on expansion on a global scale? Sometimes people get a little upset with global expansion. Ill check back to see what you have to say. It appears that you’ve put a fine amount of effort into your piece and I demand a lot more of these on the World Wide Web these days. I truly got a kick out of your post. I do not have a bunch to to say in reply, I only wanted to register to say phenomenal work. I noticed something as well about this topic on different blog.Amazingly, your linear perspective on it is diametrically opposite to what I read previously. Im still reflecting over the conflicting points of view, but Im tipped strongly toward your point of view. And in any case, thats what is so outstanding about modern democracy and the marketplace of ideas onthe internet. Well I truly enjoyed studying it. This subject procured by you is very helpful for proper planning. Hi, I found your post by mistake when i was searching google for this issue, I have to say your site is in actuality helpful I also love the theme, its amazing!. I dont have that much time to read all your post at the moment but I have bookmarked it and also add your RSS feeds. I will be back in a day or two. thanks for a great post. Nice site, looks very organized. Finally found what Ive been looking for, thanks! .net from PHP. I have aloways disliked the idea because of the costs. Is there a way I can transfer all my wordpress content inyo it? Thiis excellent website certainly has all the information I needed about this subject and didn’tknow who to ask. Touche.Sound arguments. Keep up the amazing spirit. Hello there, simply tuhrned into alert to your blog thru Google, and found that it is really informative. I am going to be careful for brussels. I will be grateful when you proceed thks in future. Numerous other folks shall be benefited out of your writing.Cheers! Hello! Woulld you mind if I share your blog witrh myy zynga group? I have been surfing online more than 3 hours today, yet I never ffound any interesging article like yours. websitee owners and bloggers made good content aas yyou did, the web will be a lot more useful than ever before. Very descriptie blog, I liked that bit. Will there be a part 2? I aam really enjoying the theme/design of your blog. great in Firefox. Do you have any suggestions to help ffix this problem? for him… lol. So allo me to reword this…. Thank YOU for the meal!! Thank you for every otheer fantastic article. Where else could anybody get that type of info inn such an ideal method of writing? Yes! Finally someone writtes about autoliker. much. I’m hoping to present something again and aid others ljke yoou aied me. plenty of valuable facts, thanks ffor providing these information. Hi there! Someone inn my Myspace group shared this site with us so I came to take a look. Wonderful blog and brilliant style andd design. We dwell in Maui and develop our personal contemporary organic meals. fantastic issues altogether, you just received a new reader. What might you suggest in regards to your publish that you made a few days in the past? Any certain? Haing read this I believed iit was very informative. annd posting comments. But so what, it was still worthwhile! and find nearly all of your post’s to be just what I’m looking for. yourself? I wouldn’t mind composing a post or elaborating on a lot of the subjects you write with regards to here. bigger and class from your local restaurant with a Fortune 500 company, have contact pages. speak with the management team. any local restaurant) would likely not want to think about how to deal with your contact requests when site traffic increases. when an e-mail request comes through. You could make a dropdown field in an application for sorts of contact requests. I was buried with contact requests once we launched beta. You should also setup redundancies so contact requests (important ones!) don’t get lost in a particular recipient’s inbox. or trigger automatic replies to contact requests with information that might solve their problem. This is perhaps all quite simple to setup with all-in-one marketing platforms like HubSpot. Hi! I could have sworn I’ve visited this site before but after looking at a few of the posts I realized it’s new to me. Regardless, I’m certainly delighted I discovered it and I’ll be bookmarking it and checking back regularly!